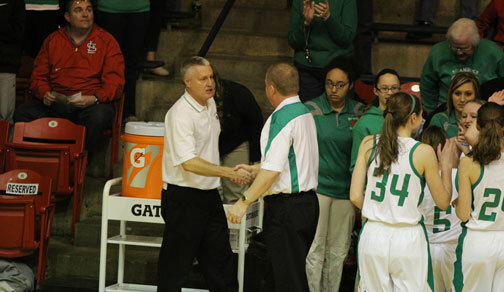 For the third straight year the famous handshake. Two years ago it was Coach Dave Luecke shaking Coach Doug Peirick's hand and the past two years it's been Peirick initiating the handshake. PARK HILLS, Mo. - Shamrocks advance to State Quarterfinals for third straight year, led by Rachel Steinhoff, Stephanie Gerling, and Kayla Meyer hitting double figures as New Haven knocks off Oran 47-27. Photo by Kelly Hoffmann. Photo gallery below. NEW HAVEN, Mo. 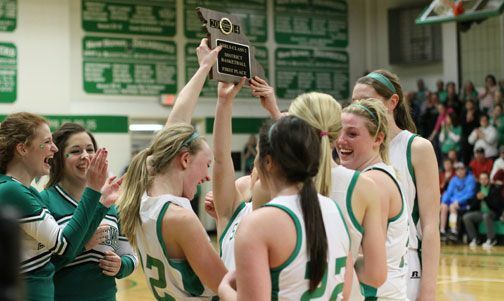 - It could not have been more fitting for New Haven seniors Emily Kallmeyer and Rachel Steinhoff to win a third straight District Championship in their last home game on their own court in front of a packed house of Shamrock fans. “It was awesome. Just the whole atmosphere that night (Friday) was amazing. You couldn’t pick a better night for my last home and last district game. It was just amazing and the crowd was awesome”, said Steinhoff. 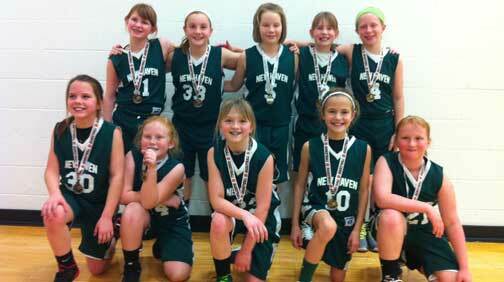 Pictured is the 4th grade girls basketball team after winning first place in the Bourbon tournament. New Haven, Mo. 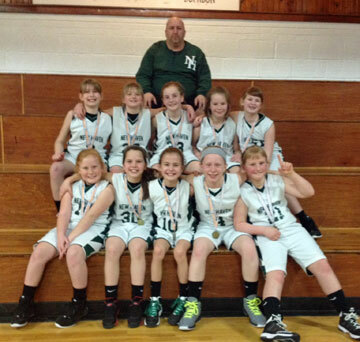 - The New Haven 4th grade girls basketball team ended their season with a third place finish in last weekend’s Rolla Tournament after winning the Bourbon Tournament on Saturday, February 15th and an overall record of 16-7. 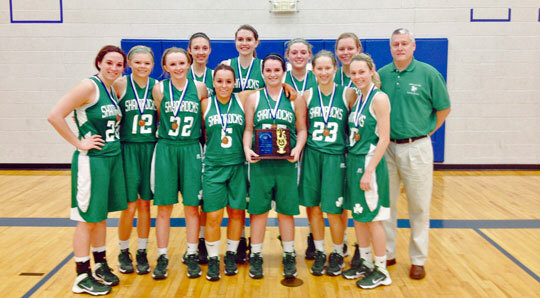 The Lady Shamrocks cruised passed Spring Bluff 38-4 in the first round of the Bourbon Tournament, advancing to the semifinals where they beat Pacific 22-12, setting up a rematch from earlier this year with Steelville. Stephanie Scheer hits a three midway through the first quarter. New Haven, Mo. 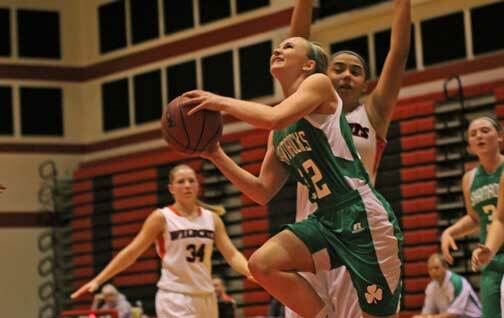 - Saturday the Lady Shamrocks rebounded with a 65-17 win over Kingston in the first round of Districts after ending their regular season with a 53-49 loss to Owensville on Thursday night. 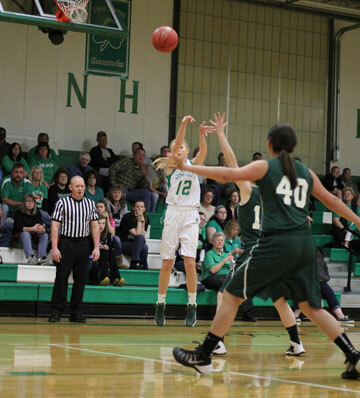 New Haven’s Stephanie’s (Scheer & Gerling) tag teamed Kingston scoring 12 of the Lady Rock’s 26 first quarter points. Scheer had the hot hand, scoring a career high and game high 12 points on 5-6 shooting from the field. Gerling, who finished with nine points, has been ridiculous from the field. Saturday she hit her first three shots after going 6-6 against Owensville two nights before. Photo Courtesy of Maddie Yarborough. In last night’s Girls Hermann Tournament Third Place make up game, Rachel Steinhoff scored 19 points and Stephanie Gerling added a season high 12 points as the Lady Shamrocks defeated St. Clair 44-39. Steinhoff helped fend off St. Clair’s fourth quarter comeback by hitting four straight free throws in the last 60 seconds after St. Clair pulled within one, giving New Haven their 16th win of the year headed into tonight's battle with Hermann. St. Clair, Mo - The New Haven 4th Grade Girls Basketball team once again had another successful weekend at the St. Clair Tournament. 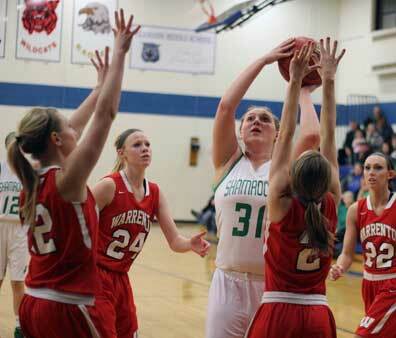 Since Christmas break Kayla Meyer is averaging 10 points a game and grabbing 7 boards. Hermann, Mo. - Monday night in the first round of the 14th Annual Hermann Girls Tournament #3New Haven picked up their fifth straight win against #6Warrenton 53-40 and setting up a Wednesday night showdown with #2Owensville after they cruised past #7Montgomery County 78-27. Rachel Steinhoff led New Haven with a team high 18 points and seven rebounds, while Kayla Meyer hit double figures for the fourth time in five games with 16 points and five boards. New Haven trailed by three with under 15 seconds in the first when Stephanie Gerling hit an 18-footer to end the quarter, pulling New Haven within one, 21-11, sparking a 17-8 run to end the half. Union, Mo. - New Haven started off sluggish in Friday night’s Four Rivers Conference game against Union and found themselves down seven (8-15) after one quarter. Led by Rachel Steinhoff’s 26 points, tying her career high, New Haven would battle back, holding Union to just two points in the fourth quarter to pick up their fourth straight win 46-30, improving to 12-4 and 2-1 in conference play.